These two could not come up with an answer, and led our group back to the battle of Bannockburn, which led Paul Smith to make this comment – and recieve banishment also! Ormston is the moderator. Are you really wanting to turn this List into a Romantics’ Haven? If you think that Paula Stiles is not a Romantic, then you are wrong. Stiles has written a piece of romantic fiction about a fraternal family liken to my real family who belonged to many fraternities and guilds. The greatest rivalry in modern history is that between Adolph Hitler and Winston Churchill. Hitler sent his Teutonic Knights in search of the Holy Grail – which I just put in the backyard of Winston Spencer Church the kindred of Princess Diana Spencer who gave birth to the future King of England – after Churchill won the war against Hitler for Britain. Hmmmmm! One can conclude that Adolph and Winston were Romantics, as was King Henry 11 who was the son of Matilda of Scotland, who is kin to many King and Queens of Scotland. Henry’s children descend from Rollo, as does his sons by Fair Rosamond. Henry was surrounded by Knights Templar. Was he a candidate for the throne of Scotland? The Sinclair family conducted a DNA test to prove they descend from Rollo. These modern-day romantics – flunked the test. The Sinclair family testified against the Templars, which may constitute the only REAL historic thing they did – after they discovered America! Well, not quite. The modern day Sinclair brood could not have discovered America if none of them have Norse blood! However, the romantic interests of Henry are full of Viking blood. Did Henry know about the New World? Winston Churchill may have been the greatest warrior of modern time. His kindred seem to be aware of the legends of Fair Rosamond – and King Arthur! 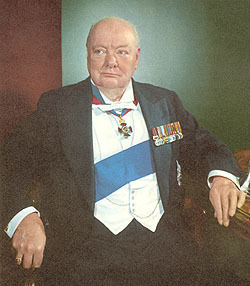 The Churchills were Grand Master Freemasons. Why have the Sinclairs ignored the OBVIOUS, they bending light around a corner to shine on their merry band of Romantics? ANSWER: Because they thought they could get away with it! So did Hitler! Thanks Winston, for standing up against the Killer Dictator of the age. Matilda had great interest in architecture and instigated the building of many Norman-style buildings, including Waltham Abbey and Holy Trinity Aldgate. She also had the first arched bridge in England built, at Stratford-le-Bow, as well as a bathhouse with piped-in water and public lavatories at Queenhithe. Her court was filled with musicians and poets; she commissioned a monk, possibly Thurgot, to write a biography of her mother, Saint Margaret. She was an active queen and, like her mother, was renowned for her devotion to religion and the poor. William of Malmesbury describes her as attending church barefoot at Lent, and washing the feet and kissing the hands of the sick. Matilda exhibited a particular interest in leprosy, founding at least two leper hospitals. She also administered extensive dower properties and was known as a patron of the arts, especially music. Saint Margaret of Scotland (c. 1045 – 16 November 1093), also known as Margaret of Wessex and Queen Margaret of Scotland, was an English princess of the House of Wessex. Born in exile in Hungary, she was the sister of Edgar Ætheling, the short-ruling and uncrowned Anglo-Saxon King of England. Margaret and her family returned to England in 1057, but fled to the Kingdom of Scotland following the Norman conquest of England of 1066. Around 1070 Margaret married Malcolm III of Scotland, becoming his queen consort. She was a pious woman, and among many charitable works she established a ferry across the Firth of Forth for pilgrims travelling to Dunfermline Abbey, which gave the towns of South Queensferry and North Queensferry their names. 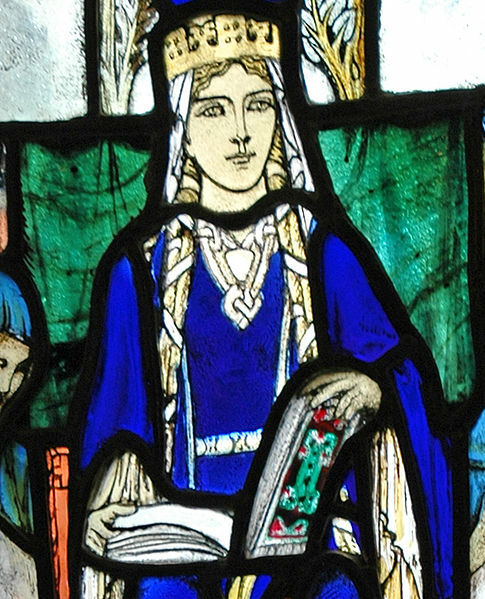 Margaret was the mother of three kings of Scotland and a queen consort of England. According to the Life of Saint Margaret, attributed to Turgot of Durham, she died at Edinburgh Castle in 1093, just days after receiving the news of her husband’s death in battle. In 1250 she was canonised by Pope Innocent IV, and her remains were reinterred in a shrine at Dunfermline Abbey. Her relics were dispersed after the Scottish Reformation and subsequently lost. The House of Wessex, also known as the House of Cerdic, refers to the family that initially ruled a kingdom in southwest England known as Wessex, from the 6th century under Cerdic of Wessex until the unification of the Kingdoms of England. The House became rulers of all England from Alfred the Great in 871 to Edmund Ironside in 1016. This period of the English monarchy is known as the Saxon period, though their rule was often contested, notably by the Danelaw and later by the Danish king Sweyn Forkbeard who claimed the throne from 1013 to 1014, during the reign of Æthelred the Unready. Sweyn and his successors ruled until 1042. After Harthacanute, there was a brief Saxon Restoration between 1042 and 1066 under Edward the Confessor and Harold Godwinson, who was a member of the House of Godwin. After the Battle of Hastings, a decisive point in English history, William of Normandy became king of England. Anglo-Saxon attempts to restore native rule in the person of Edgar the Ætheling, a grandson of Edmund Ironside who had originally been passed over in favour of Harold, were unsuccessful and William’s descendants secured their rule. Edgar’s niece Matilda of Scotland later married William’s son Henry I, forming a link between the two dynasties. Henry of Scotland (Eanric mac Dabíd, 1114 – 12 June 1152) was a prince of Scotland, heir to the Kingdom of Alba. He was also the 3rd Earl of Northumberland and the 3rd Earl of the Honour of Huntingdon and Northampton. He was the son of King David I of Scotland and Maud, 2nd Countess of Huntingdon. His maternal grandparents were Waltheof, Earl of Northumbria and Huntingdon, (beheaded 1075) and his spouse Judith of Lens. Henry was named after his uncle, King Henry I of England, who had married his paternal aunt Edith of Scotland (the name Edith gallicised as Matilda after becoming Queen consort in 1100). He had three sons, two of whom became King of Scotland, and a third whose descendants were to prove critical in the later days of the Scottish royal house. He also had three daughters. His eldest son became King of Scots as Malcolm IV in 1153. Henry’s second son became king in 1165 on the death of his brother, reigning as William I. Both in their turn inherited the title of Earl of Huntingdon. His third son, David also became Earl of Huntingdon. It is from the 8th Earl that all Kings of Scotland after Margaret, Maid of Norway claim descent. On Henry’s death, the Earldom passed to his half-brother Simon II de Senlis. The Spencer family is one of Britain’s most illustrious aristocratic families. This noble family descended in the male line from Henry Spencer, claimed to be a descendant of the cadet branch of the ancient House Le Despencer (died c. 1478), male-line ancestor of the Earls of Sunderland, the Dukes of Marlborough, and the Earls Spencer. Two prominent members of the family were Winston Churchill and Diana, Princess of Wales. According to tradition, William St Clair, (William Sinclair) 3rd Earl of Orkney, Baron of Roslin and 1st Earl of Caithness built Rosslyn Chapel. A later William Sinclair of Roslin became the first Grand Master of the Grand Lodge of Scotland. The St Clair, later Sinclair, Earls of Rosslyn or Roslin have also been connected to Templarism in Scotland, but Mark Oxbrow and Ian Robertson in their recent book, ‘Rosslyn and the Grail’, note that the St Clair of Rosslyn testified against the Templars at their trial in Edinburgh in 1309. Dr. Louise Yeoman points out that the Rosslyn/Knights Templar connection is false, having been invented by 18th century fiction-writers, and that Rosslyn Chapel was built by William Sinclair so that Mass could be said for the souls of his family. In Michael T.R.B Turnbull’s book Rosslyn Chapel Revealed he states that “Eighteen years after the suppression of the Order, Sir William Sainteclaire, in the role of a Crusader(not Templar), made a brave and honourable bid to fulfil the wishes of his late monarch, King Robert The Bruce”. He then explains that he and his wife Lady Margaret Ramsay of Dalhousie produced a son (also Sir William)to succeed him as the 8th Baron of Rosslyn. Turnbull States that “His father could never have been a Knight Templar, as his wealth and marriage would have broken two of the three Templar vows — Poverty and chastity”. Years of research by Sinclair historians has pointed to our ancient connection to the Norse, in general, and the line of Rollo, in particular. Yet, when most researchers dig into the prehistory of the Vikings, they speak of the Goths. Our DNA suggests that we do not match the haplogroups of the classic Norse – R1a, I1a, N and Q. In fact, to date, only one Sinclair in our project is a part of these haplogroups – the R1a. This, taken in context with the author and Flemish historian Beryl Platts insistence that the Sinclairs are not of Norse origins, could make this project the bearer of bad news. But read on because, like so many parts of our history, it’s complicated. In the seventeenth century, interest in Templarism became political after the execution of Charles I, with the idea that Stuart partisans invented a Templar degree, as the king’s death was to be avenged, as was the violent death in 1314 of Jacques de Molay, last Grand Master of the Templars. The story told by Dom Calmet was that Viscount Dundee was supposed to have been an early Templar Grand Master and to have fallen at Killiecrankie wearing the Grand Cross of the Order. The Duke of Mar is then said to have held office, after which time the Templar Order was apparently inactive until its revival by Charles Edward Stuart in 1745. An original letter of the 3rd Duke of Perth to Earl of Airlie Lord Ogilvy shortly after the Jacobite victory at Prestonpans, described a secret ceremony at Holyrood in which the prince was elected Grand Master of the ancient chivalry of the Temple of Jerusalem on Tuesday 24 September 1745. Templarism experienced a revival of interest in the eighteenth century through Freemasonry with a Scottish influence. The first record of this is in Ramsay’s Oration in Paris in 1737. Andrew Michael Ramsay was tutor to the Young Pretender, Prince Charles Edward Stuart. He claimed that Freemasonry had begun among crusader knights and that they had formed themselves into Lodges of St John. The next development was with Karl Gotheif, Baron Von Hund, and Alten-Grotkau, who had apparently been introduced to the concept by the Jacobite Lord Kilmarnock, and received into a Templar Chapter by a mysterious “Knight of the Red Feather”. Baron von Hund established a new Masonic rite called the “Strict Templar Observance”. The “Knight of the Red Feather” has been identified subsequently as Alexander Seton better known as Alexander Montgomerie, 10th Earl of Eglinton, a prominent Freemason in the Jacobite movement. The modern revival of Templarism in Scotland starts with Alexander Deuchar. The records of one of Scottish Freemasonry’s most prestigious lodges, the St Mary’s Chapel Lodge of Edinburgh, describe the visit of a “…deputation from the Grand Assembly of the High Knights Templar in Edinburgh… headed by their most worshipful Grand Master, Alexander Deuchar…the first time for some hundred years that any Lodge of Freemasonry had been visited by an assembly of Knights Templar, headed by their Grand Master.” This implies that there was an Order in existence 100 years earlier. In 1811 with a Charter from the Templar Grand Master in England, the Duke of Kent, Alexander Deuchar established the Grand Conclave of Knights of the Holy Temple and Sepulchre, and of St. John of Jerusalem. Controversially in 1836 “…it was proposed that non-Masons be admitted to the Order, at the same time the ritual was adapted in order to allow this to happen.,, . Previously only Royal Arch Masons in Good Standing were allowed to join. Only the Royal Grand Conclave was allowed to admit non-Masons and these men were never members of any Encampments, only of Grand Conclave.” The modern non Masonic Order Militi Templi Scotia claims descent from Alexander Deuchar who was a Freemason. Templarism in Scotland has been claimed as the root of both Masonic and non-Masonic Orders. 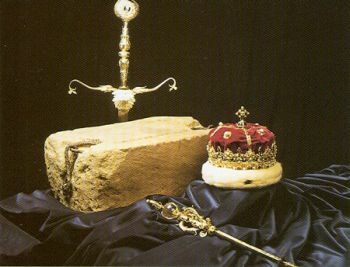 The Masonic Movement is generally referred to as the Knights Templar, but the full Style and Title of this body is “The United, Religious and Military Orders of the Temple and the Order of St. John of Jerusalem, Palestine, Rhodes and Malta”. 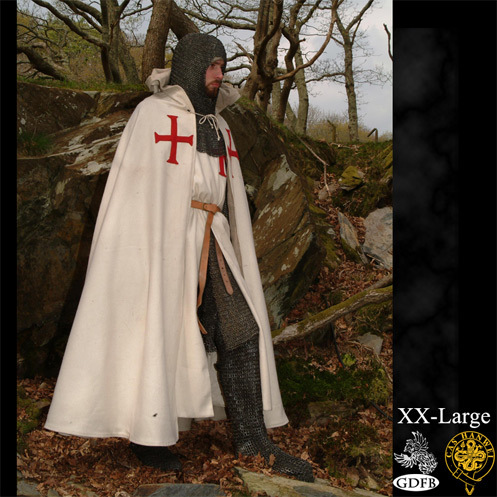 There are today a number of small Groups of non-Masonic Knights Templar in Scotland, though not all claim descent from either the medieval Knights Templar in Scotland or Alexander Deuchar. They include : The Autonomous Grand Priory of Scotland; The Grand Priory of the Knights Templar in Scotland; The OSMTH/SMOTJ International recognized Body in Scotland; The Grand Priory of Scotland of OSMTH “Regency”; The Magisterial Grand Priory of St Anthony Scotland of the SKT-SMOTJ & IFA-OCMTH; The Confederation of Scottish Knights Templar or the International Federative Alliance; The Ancient Scottish Military Order of Knights Templar and Militi Templi Scotia. In 2006 the “Commandery of St. Clair” No S1, Edinburgh, was chartered by the OSMTH Grand Priory of France. The Commandery recently received affiliation of OSMTH International at Commandery Status under the Mentorship of the Grand Priory of France. Ordo Supremus Militaris Templi Hierosolymitani – The Grand Priory Of The Knights Templar In Scotland Ltd is registered with Companies House in the UK and is working under the authority of The Commandery of St Clair, Edinburgh, No S1,Grand Priory of France (GPFT), OSMTH International. Knights Templar Internationally use the Cross pattée, including The Commandery of St Clair in alignment with the International Order OSMTH, The Grand Priory of the Scots (mainly American Scots) a Cross with two branches, and other Scottish Knights Templar Groups use the Eight Pointed Cross coloured red more commonly but not exclusively known as the Maltese Cross, of the Knights Hospitaller or Order of St. John or Cross of Amalfi. The Scottish Templar use of the Maltese Cross probably dates to the 1960s although the Cross itself is much older. The Scottish Knights Templar of OSMTH International have their own tartan. It was ratified and approved by the Grand Conclave of Militi Scotia S.M.O.J in Perth 28 March 1998. The original name was “Scottish Knights Templar of Militi Templi Scotia International.” but it was changed to “Scottish Knights Templar of OSMTH International” in 2006. OSMTH stands for; “Ordo Supremus Militaris Templi Hierosolymitani”.